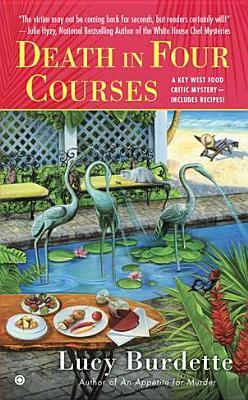 The annual Key West literary conference is drawing the biggest names in food writing from all over the country, and Haley is there to catch a few fresh morsels of insider gossip. Superstar restaurant critic Jonah Barrows has already ruffled a few foodie feathers with his recent tell-all memoir, and as keynote speaker, he promises more of the same jaw-dropping honesty. But when Hayley discovers Jonah’s body in a nearby dipping pool, the cocktail-hour buzz takes a sour turn, and Hayley finds herself at the center of attention—especially with the police. Now it’s up to her to catch the killer before she comes to her own bitter finish. Clinical psychologist Roberta Isleib, AKA Lucy Burdette, has had eight previous mysteries published. Her books and stories have been short-listed for Agatha, Anthony, and Macavity awards. Her story “The Itinerary,” under the Roberta Isleib name, was selected for inclusion in The Rich and the Dead, an MWA anthology edited by Nelson DeMille. She is a past president of Sisters in Crime.